Elsewhere in the field, Pierre Gasly’s reign as hero of the field after his morale-boosting points-finish at the last race, ended prematurely when he broke the golden rule of racing, crashing into Brendan Hartley, his own Toro Rosso teammate. Both cars continued on, but broke a lot of carbon fiber, calling out a full course safety car to get it cleaned up. Because of the timing of the safety car period, the Ferrari and Mercedes drivers at the head of the field could not pit to swap out their tires, and continued on with their plan of running the final twenty laps on the white compound. Meanwhile, both Red Bull cars pitted to put on softer tires for a storming sprint to the flag. Nowhere was the Larry Enticer ethos more evident than in Ricciardo’s multiple flawless late-braking passes on Lewis Hamilton, Kimi Räikkönen, Sebastian Vettel, and ultimately Valtteri Bottas for the lead. It was a series of moves that absolutely wowed the crowds, and the folks watching at home. Ricciardo was sensational, and was able to capitalize on the team’s strategy call for tires. 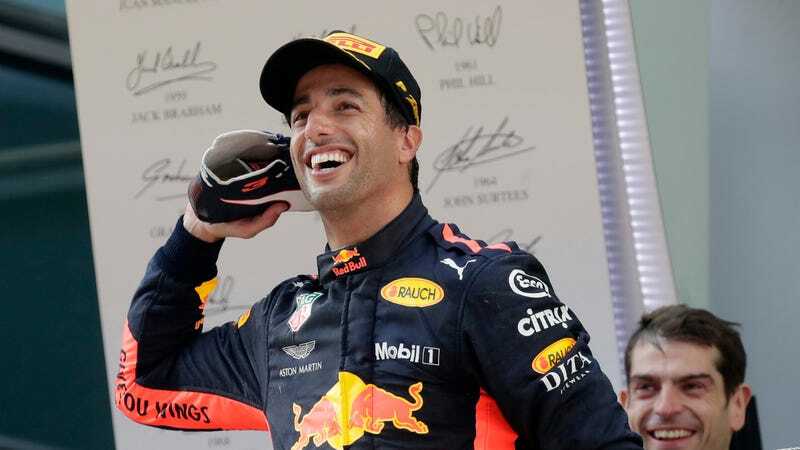 Ricciardo exited the pits with his fresh boots on only 20 laps from the race’s end, and managed to pass five other world-class drivers in that short time. It was bold and exciting, and everything Formula One ought to be. While Daniel Ricciardo was showing the world how it was done, his Red Bull teammate Max Verstappen had nothing but trouble. Verstappen’s attempted pass on Hamilton ended with an off-track excursion to avoid touching, and his run up the inside of Vettel ended with contact and both drivers spinning off into the weeds. Ultimately, Verstappen was given a penalty for the contact, and finished in fifth. While the tire-strategy formula of the current generation of F1 racing is a bit contrived and often boring, it seems to reward viewers twice over when things go slightly off kilter. By virtue of the safety car scuppering many drivers’ strategies, the race was actually exciting. There was a tense battle shaping up between Vettel and Verstappen before the safety car period, but it was ultimately more fun to watch all of that implode as their tire compounds wore away and the fresher tired Red Bulls storm to the front. This is the kind of balls-to-the-wall racing that we want to see. For every ten Grands Prix with a boring finish, there is one that completely blows my mind. This was that one. The racing this year has actually been somewhat interesting to watch, given a few races with exciting first segments. This race was exciting from start to finish. Let’s hope there are more coming this season just like this one. Daniel really is the best kind of racing driver. Protect him, for he is too pure for this world. Has Formula One Ever Actually Been Good?